Anchovies. It’s a food that can bring thoughts of revulsion to many, along with memories of bad pizza experiences and those smelly, brown, tinned things that bear no resemblance to actual fish. And yes – anchovies are actual fish. A fact that is, surprisingly, news to some. But served fresh or preserved properly, they are somewhat sweet and quite good in many applications. I picked up a pack of white anchovies from Spain for my pressed baguette sandwich. They were not cheap and therefore I wanted to be sure to find a good use for the remaining filets. Enter Bagna Cauda. It’s an Italian dip that is traditionally served with fresh vegetables. I added a loaf of homemade bread and sautéed shrimp to my Bagna Cauda platter and a light lunch was served. Interestingly, I found that the veggies were not a very good pairing for the dip. However, the homemade bread and shrimp were fantastic. Aside from anchovies, the dip is made up of butter, olive oil and garlic – always a delicious sauce for bread and shrimp. I saved my leftover Bagna Cauda to toss with pasta. All it needed was a light sprinkling of parmesan and I had a great dish. Two dishes for the price (and effort) of one. Love that! Heat the olive oil in a small pan over medium heat and add the anchovy filets. Stir occasionally until the anchovies begin to dissolve in the oil. While you’re waiting for the filets to dissolve, use a microplane to grate the garlic cloves into the sauce. Let everything simmer together for 8 – 10 minutes and then finish by stirring in the butter. This sauce needs to stay hot so serve it in a butter warmer or other dish that has a heat source. Serve with what you like, but I recommend the shrimp and fresh bread. I have been trying to get into anchovies...I feel sort of provincial hating them. I have yet to land on a really good anchovy but I'm willing to keep trying...if only to make this dip one day. Bagna cauda is DIVINE! I've only done a version from anchovy paste thus far. Looking forward to buying true anchovy soon and setting to work on this. Gosh, I couldn't even describe how much I love Bagna Cauda. Sometime I serve this with vegetable crudite, unfortunately not too many people know how to appreciate this delicious sauce/dip. Yours look so mouth watering! I like bagna cauda, but most times I just end up dipping bread in the mix and use up all the oil in about 5 minutes, leaving no dipping sauce for the veggies. But oh my do I love cardoons dipped in the anchovy sauce. Love this with a muscadet or mineral Italian white. i just have never been able to get into anchovies. i've tried, and my italian part of me hates myself for it. but your pictures are gorgeous! I have to agree with those previous comments about not liking anchovies. But, on the other hand, that does look appetizing! It's 8am and I'm drooling over anchovies. 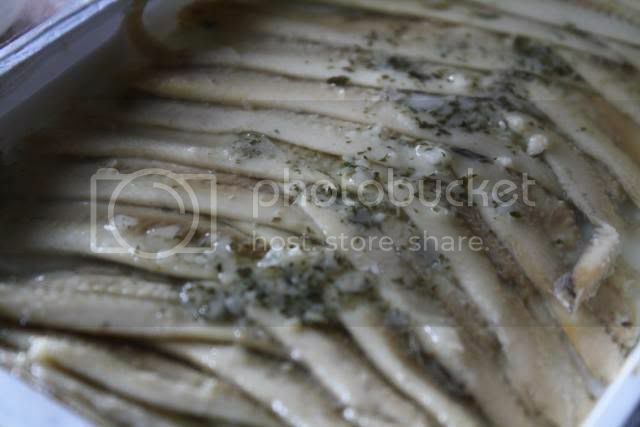 I love cooking with anchovies, they melt away and leave a nutty flavor that none of my guests ever detect is anchovies. I've never tried them on a sandwich. Yum, I love bagna cauda but have never made it. You've given me the incentive to try. This sounds divine. Love anchovies, it's such a good source of umami. Have you ever tried curing your own anchovies? I have never been a huge fan but maybe I will try them again! Marc - No, I have never cured my own, they I've been reading about how to filet my own in Marcella Hazan's Essentials of Classic Italian Cooking so maybe curing will be the next step! Alexandra - Boquerones are Spanish cured white anchovies, so what I've used here, cured white anchovies, would be pretty close to the same thing. I would definitely recommend these for a Caesar dressing! I adore white anchovies, so much creamier and milder than the regular brown anchovies. I really want to give this dip a try with the white anchovies! I really like bagna cauda - which vegetables were you dipping in it? I love it with sticks of cucumber or blanched broccoli. I love bagna cauda, and recently made a pasta dish that is an extrapolation of that delicious dipping sauce. The recipe comes from "Cucina Ebraica", but is basically bagna cauda with the addition of a bunch of fresh italian parsley, lemon zest, and some toasted breadcrumbs. I tossed it with fettucine and the result was superb--delicate, perfectly balanced, and so satisfying.